Some of this year's coolest toys are from small toymakers. Here are seven hot toys that just might be the smash-hit of the holiday 2012 season. You don't want to mess with sharks in the ocean. But the Illumivor Mecha-Shark from Skyrocket Toys begs to be played with. The 18-inch-long, remote-controlled toy glows in the dark and chomps its teeth as it "swims" across the floor to the sound of ominous music. Besides the shark, the Illumivor collection includes three other smaller 8-inch characters -- the Electro Piranha, Hydro Jaw and the Shock Angler. The Illumivor toys are only the second product from the two-year-old Los Angeles startup. But they're getting a lot of buzz. 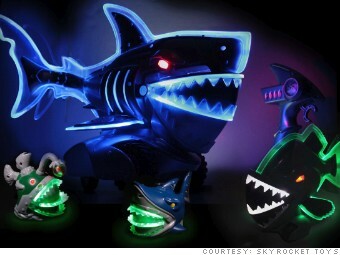 Toys R Us has locked in a deal to be the exclusive retailer for the Mecha-Shark during the holiday season. "Our mission has been to find cool technology," said Skyrocket Toys co-founder John Ardell. "Illumivors are where remote controls meet robotics. They're meant to be a 'WOW' toy."